La grande assiette is a term for a tailoring method used in the mid/late 14th century and throughout the fifteenth century in which a sleeve was inserted into a deeply-set arm hole with the assistance of triangular gores. A freely moving sleeve piece set deeply into the body of the garment allowed full and unconstricted movement of the arms, chest, and shoulders while maintaining a relatively fitted appearance. When moving one’s arms in a windmill fashion, the bottom portion of one’s garment would remain stationary, adding a degree of comfort and convenience for laborers and the martially-inclined. 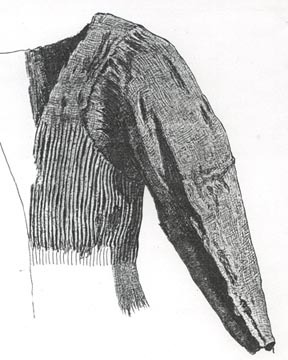 The historical use of gores/gussets instead of large, mushroom-shaped sleeve caps probably assisted fabric conservation as well as the ability to fine-tune the tailoring with bias-vs.-straight-grain combinations, different angles and points of ‘flare’, and varied sizing of the inserted gores. Pour la façon et estoffes de deux pourpoins que au partement de MdS de sa ville de Bruges pour aler en Hollande fist faire derrain de fustane noire, l’un de quatre quartiers et doublé de cinq toilles, et l’autre à grands assiettes doublé de trois toilles, pour chascun XLs., font IIII 1.>> (Laborde, Les Ducs de Bourg., t. I, no. 1075). [To Perrin Bousuot, chamber valet and tailor… for two similar pourpoints made for MdS in his town of Brussels, one of black damask in four quarters and the other lined with six layers and leather between large plate-like arm holes. 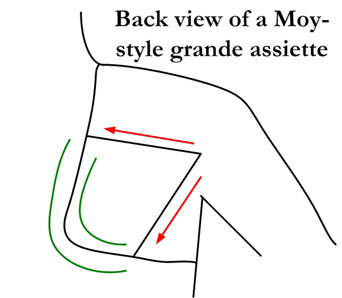 In French, the words grande assiette translate literally into “large plate”, which makes descriptive sense in light of the shape of the arm hole seam — a large circle encompassing the shoulder almost to the neck, part of the chest, part of the back, and a significant portion of the torso under the arm. The words might also mean “large seat”, which could be a reference to the extremely deep “seat” of the sleeve. Assiette could also simply be a synonym for the French word for ‘arm hole’, emmanchure. The quote above indicates that multi-layered grande assiette-style garments were used for fashionable clothing as much as for military or laboring use. 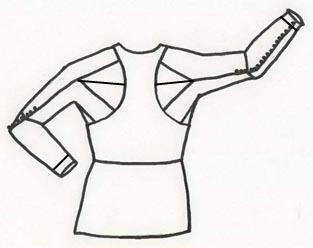 The examples below show mid/late 14th century and 15th century illustrations of garments possibly using this tailoring technique. Some of these images depict a quilting effect that may or may not follow the deeply exaggerated arm holes of a garment cut this way. Whether or not the images are meant to portray the grande assiette construction, this quilting pattern undoubtedly derived its inspiration from it. Some images show simple seam lines or two-tone visual emphasis which allude to it or possibly mimic it. Note also that this style seems to have crossed over from military function to civilian fashion and remained interwoven between those two worlds from the late 14th century through most of the 15th century. Romance of Alexander, MS Bodleian 264, fol. 91 recto, ca. 1344. The two tones, red and pink, suggest a layering of possibly two garments, or perhaps a visual emphasis on grande assiette construction. Below are some turn-of-the-15th century images depicting a similar look —are they two layers or one, cut from different cloths to emphasize grande assiette construction? Hard to know for sure. This manuscript can be viewed via high-resolution images at the Bodleian Library online. Plate XXI (fol. II recto) from The Egerton Genesis (Coker Joslin and Coker Joslin Watson). Abraham intercedes for Sodom and the angels encounter Lot. Is he wearing a vest, or a single garment with grande assiette construction? The shading as drawn suggests two separate garments, but we cannot know for sure. From p. 109 of Fashion in the Age of the Black Prince by Stella Mary Newton. ; Weltchronik, Golden Legend detail, fol. 21verso; no seam lines evident, but Newton supposes the garment has grande assiette construction due to the ease of movement of the arms and the close fit of the hips and puffy chest — stylistic elements common to the grande assiette garment at this time. Heinrich Wittenwiler: Der Ring Schwaben (? ), um 1410, Pergament, 57 Blätter Signatur: Cgm 9300, Bl.1v. The man appears to be wearing a cotte with a quilting pattern that emphasizes the “big plate” look around the arm holes. Is this pattern present because grande assiette construction is present too, or is it simply stylish for the time? If the latter, was the “big plate” quilting pattern originally inspired by grande assiette construction. Likely, yes. From p. 64, Dress in the Middle Ages, by Piponnier & Mane. Roman de Guiron le Courtois, Bib. Nat, Paris. Naf. 5243, fol. 50; northern Italy, last quarter of the fourteenth century. Another example of the “big plate” quilting pattern on close-fitting pourpoints. 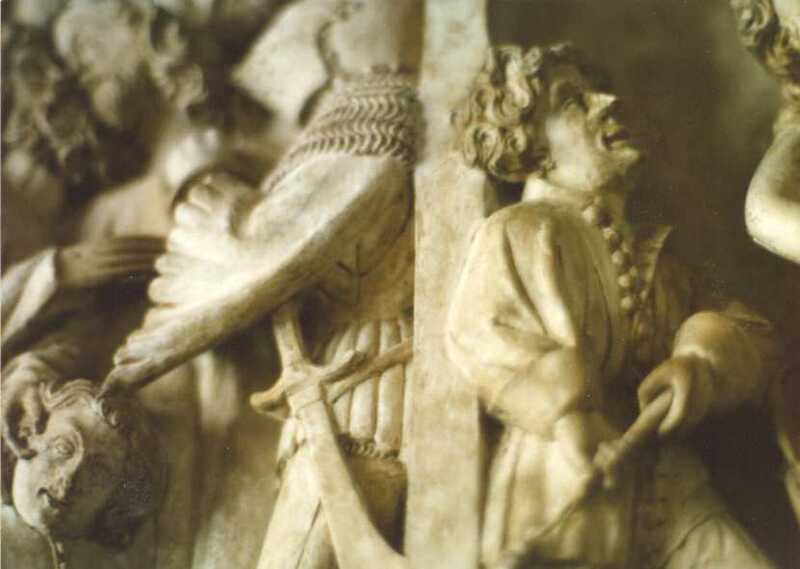 Close-ups from a late 14th/early 15th century (? *) German altar frontal in the Isabella Stewart Gardner Museum (Boston); note the quilted pattern radiating from the arm holes across the chest; thanks to Chuck Davis for permission to use his photos. *This museum holds an ‘art for aesthetics’ sake’ philosophy which sometimes directly translates to lack of useful information for the observer, such as provenance, dating, geographic origin, etc. From a manuscript depicting Boccaccio’s Des Cleres et Nobles Femmes in the Bibliothèque nationale, MS Français 598, fol. 40 verso. This intriguing outfit, whether constructed of one fashion layer in two tones or two layers, appears often enough in the French art of the first decade of the 15th century. This particular manuscript abounds with images of this sort and can be found at the Bibliothèque nationale’s Gallica site. The next image shows a strikingly similar garment or suit of clothes. 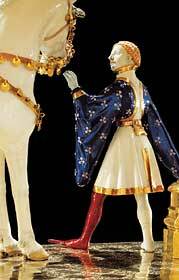 A paint-glazed and gilded sculpture called the Goldenes Rössl was completed in 1404 or 1405 as a royal gift from Isabeau of Bavaria to Charles VI (photo by Bayerisches Nationalmuseum). This figure from the tableau has bag sleeves, while the figure above has ‘angel wing’ sleeves, both popular in noble fashion circles at this time. Note the thick outline of gold along the deeply-set arm holes; the figure above has what appears to be checked trim in the same spot. Any gores that may have been used to fill in the area between the arm holes and the beginning of the arms themselves do not appear to be outlined. 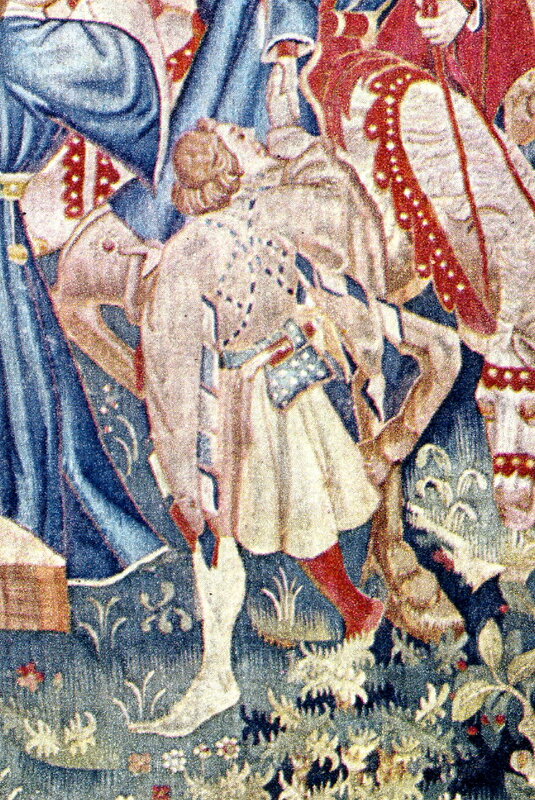 This figure from a tapestry called Story of St Piat and St. Eluthiere made in Arras around 1402 and residing in Notre-Dame de Tournai shows the back-facing gores of the grande assiette in outline, in addition to the deeply-set arm holes. Outlining the gores, whether in woven trim or in embroidery, appears to be somewhat rare in the art of the period. Thanks to Tracy Justus for drawing attention to this unique source. My copy of this image can be found in The Book of Tapestry: History and Technique by Verlet et al. 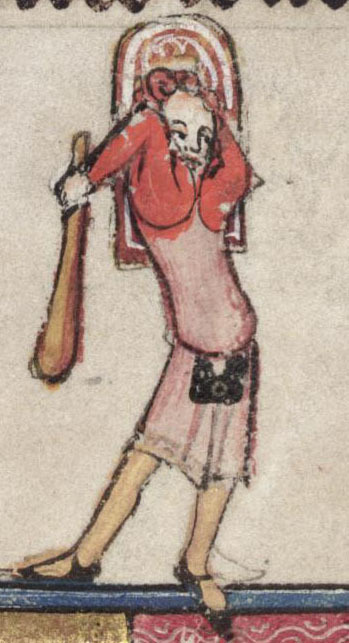 From a Sachsenspiegel manuscript ca. 1405 in Luneberg (northern Germany) seen in Marcel Thomas’s The Golden Age (plate 35). Again, the mysterious two-toned garment or layering of two garments. I am inclined to think this is one garment made of two materials. Thanks again to Tracy Justus for mentioning this image in a timely manner. 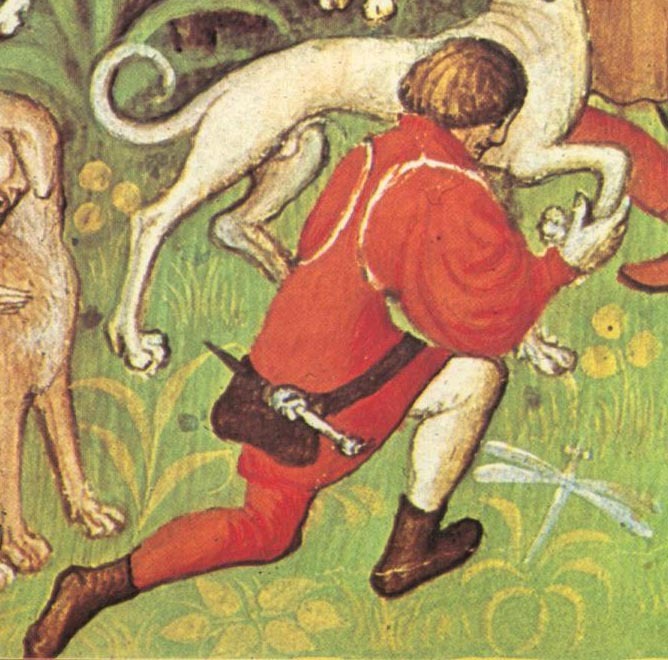 From a manuscript depicting the Livre de la Chasse by Gaston Phebus. Bibliothèque nationale, MS Français 616, fol. 40v, early 15th century. 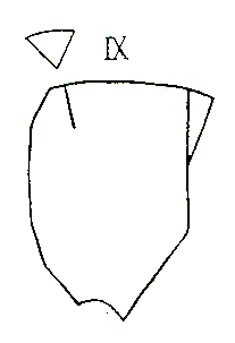 This figure portrays a white outline along a deeply-set arm hole; others in the same image and throughout the manuscript have seam lines showing normally-proportioned set-in sleeves. My copy comes from Illuminated Manuscripts: Medieval Hunting Scenes (“The Hunting Book by Gaston Phoebus”), text by Gabriel Bise. 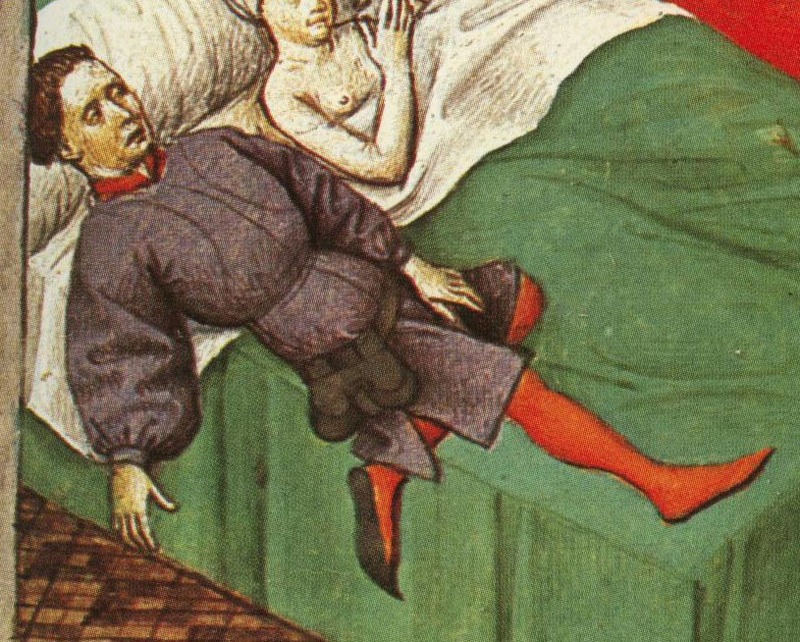 From a French manuscript depicting Boccaccio’s Decameron, circa early 15th century. The man’s cotte shows deeply-set arm hole seams, but again, no sign of triangular gores. The regular emphasis by artists on deeply-set arm hole seams begs the question of whether or not these garments’ sleeves were cut in one piece on occasion or if they were usually or occasionally gored. Perhaps the fashion of the time routinely emphasized the arm holes, but not the gores, even though the gores may have been a regular feature? This picture comes from Illuminated Manuscripts: Boccaccio’s Decameron, text by Edmond Pognon. From the Hans Tallhoffer fechtbuch, 1459 edition, fol. 182 (Southern German). 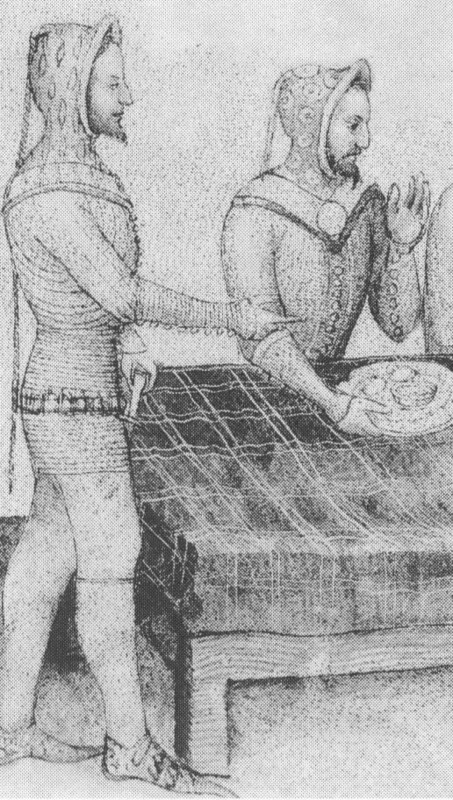 The tight-fitting doublet of the man in the foreground appears to have grande assiette construction. Many of the garments in this manuscript depict deeply-set arm holes, sometimes with the two-tone look discussed above. Georges Bernage, editor of Moyen Age magazine and author of a couple of articles on the Charles de Blois pourpoint and grande assiette tailoring, thinks two-tone grande assiette images are depicting one garment in which the two colors serve to emphasize the tailoring. I lean toward agreeing with that assessment due to the smooth transition from one color to the other (no gaping, wrinkling, or tell-tale shadows hinting at two layers). 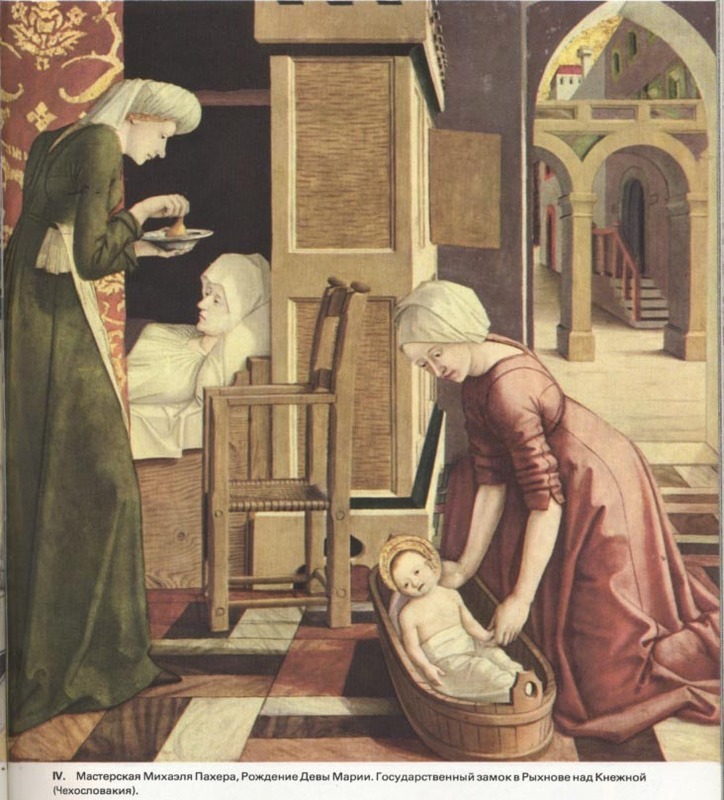 This image done by Maître François in his illuminations of La Cité de dieu by Augustine around 1475-1480 begins to show a trend toward the use of grande assiette tailoring for feminine garments as seen in the art of the late 15th century. This image is called Mysteries of Cybele (Virgo caelestis, Berecynthia) – fol. 86 verso. Thanks go to Susan Farmer for bringing this manuscript to my attention. The Birth of the Virgin Mary, c. 1470-1480, attributed to the Master of Uttenheim, an un-named Tyrolean artist. Located in a castle in Rychnov nad Kněžnou, Czech Republic. Thanks to Anneke Lyffland and Kass McGann for the picture, and to Beatrix Nutz for the updated attribution. The green gown, as well as the pink gown worn by another woman in the larger version of this image, is clearly cut with deep-set arm holes. As pointed out to me by Ms. Lyffland, triangular gores appear on the backs of both of these gowns, but they are rotated lower than the position seen in other examples of grande assiette construction such as the Charles de Blois cotte, the Moy gown, and the 1402 Arras tapestry noted above. As you can see below in my imperfectly proportioned (but simplified) diagrams, the front is cut in two main panels with exaggerated arm holes. Large triangular gores are set into the middle of the chest, following the general shape of the pectoral muscles. The gore ends precisely at the point where the torso meets the arm: the pivot point. The back, however, is cut in one piece from the waist up, with matching deep-set arm holes. Again, large triangular gores sit in the middle of the arm hole, this time following the shape of the scapula. 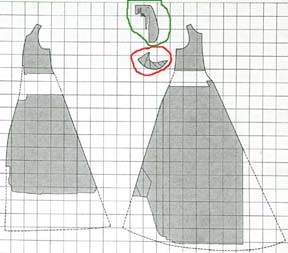 It is worth noting that in the original pattern the back gores are about twice the size of the front gores in width and length, when pieced together from two triangles. This makes sense on the average muscular man, as the back tends to be broader and rounded, requiring a roomy fit. To fit the arm hole and sleeve precisely (and probably for the purpose of fabric conservation), a sliver-like gore sits directly under each arm, pointing into the armpit. For a much more detailed breakdown of the pattern pieces and how they fit together to create the grande assiette sleeve, see Cut to Pieces by a Determined Tailor. 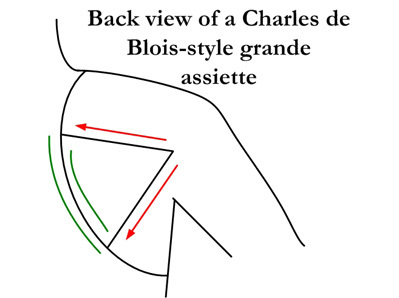 For more information on the seam around the elbow, see The “elbow hinge” tailoring of the Charles de Blois pourpoint. The pattern itself, as laid out by Adrien Harmand in Jeanne d’Arc: Ses costumes, son armure: Essai de reconstitution (and copied extensively in subsequent treatments of the subject) is not always immediately obvious to the casual observer. To begin with, the sleeve pattern derives from vertically-cut pieces that come together to form simpler, larger pieces. The original tailors undoubtedly used this complex cutting method to get maximal use out of the expensive silk brocade. The pieces marked with a green dot below come together to form one large triangular back gore. The pieces marked with blue dots form the base of the upper arm pattern and the pieces marked with red dots form the forearm and wrist section. The deeply-set arm hole and heavily-gored sleeve work together to create a dramatic flare of accommodation for the movement of the body when the arm pivots in the shoulder socket. 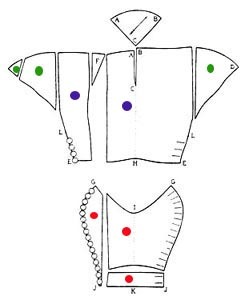 This is the key to creating a reasonably body-skimming garment allowing free movement in every direction the arm can stretch without excessive pulling of the fabric covering the chest, back, and torso. 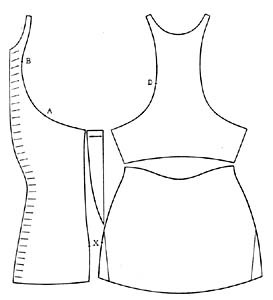 Depending on body shape, the depth of the arm hole and the width of the gores can be altered to make the shoulder flare less extreme or more pronounced. A deeper arm hole and wider gores will work well on a barrel-chested man with defined lattisimus dorsi, back, and chest muscles, for instance, while a shallower arm hole with narrow gores (as seen in the front of the Moy gown, discussed below) may make more sense for small-framed women or thin men. How is this any better than setting a rounded sleeve cap into a closely-fitted, rounded arm hole? With experience, we see that the closer into the armpit an arm hole and sleeve are set, the more range of motion the arm has. 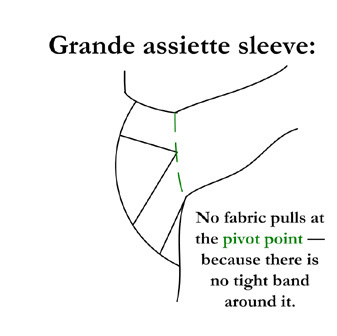 With grande assiette tailoring, the difference is that there is no tight ring of fabric encircling the plane from which all arm movement initiates (the pivot point). It is this point — where the sleeve cap fits into the arm hole — that pulls the fabric on the body when the arm moves around. 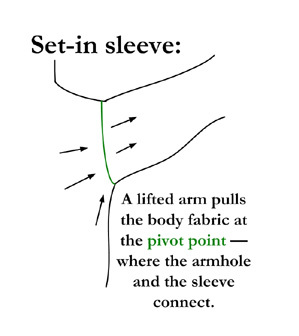 This may be a quite subtle difference in effect, if a tailor is capable of perfectly fitting a typical set-in sleeve into the pivot point for a particular body. In such a case, good range of motion results, and there is no pressing advantage for grande assiette construction. 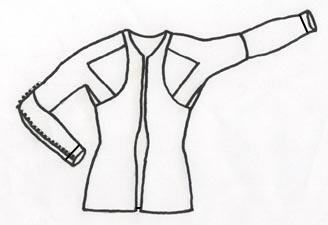 In the case of a loose garment with a generously-cut arm hole and loose sleeve, the movement of the torso cloth might not be much of an issue. Grande assiette tailoring simply adds another option to one’s tailoring choices, especially for snug-fitting work-a-day and military garments. As the arm lifts and stretches, the bottom portion of the garment does not ride up, freeing the wearer from having to pull his or her garment back down over the waist or hips repetitively. Not all pictorial or extant evidence follows the “large plate” look. The Moy gown, a fragmented garment pulled from a bog in Ireland and dated roughly to the 15th century, provides another example of the grande assiette. In this case, the portion of the arm hole facing the front of the body is relatively shallow in comparison to the back portion, which is deep and shaped as though to follow the contours of the shoulder blades. The trapezoidal gussets (as seen on Marc Carlson’s page) set into the back of the arm hole could be called triangular gores with a distended arc that begins to look more like a point. The tailoring effect is the same for triangular gores and trapezoidal gussets because all 3-D fabric-shaping occurs along the seams that radiate out from the plane of the shoulder meeting the arm. 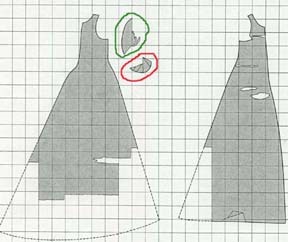 The red lines indicate where the tailoring, or shaping of the sleeve as a 3-dimensional piece, occurs. The green lines show seams that exist simply to attach the gore/gusset to the body piece. Three-dimensional shaping does not occur along these lines because the curves of both pieces fit together exactly. If the gores were curved differently from the body pieces, a 3-D effect would occur when sewn together. Herjolfsnes gown number 58 —mini-grande assiette? According to Marc Carlson’s page on this garment, recent carbon dating has placed it between 1315 and 1375. If so, the Greenlanders appear to have been reasonably aware of the tailoring methods of mainland Europe. It is my guess that this gown was altered — somewhat inexpertly, from the looks of multiple, small pieces filling in the gussets — after its initial construction so that it would fit someone with smaller arms and likely a smaller torso. The grande assiette construction method—emerging from military innovation—eventually entered the civilian fashion world for men and gradually made its way into women’s clothing by some point in the 15th century. As a style, its appearance ranged drastically, from padded and quilted pourpoints to two-toned cottes, to work-a-day feminine gowns. 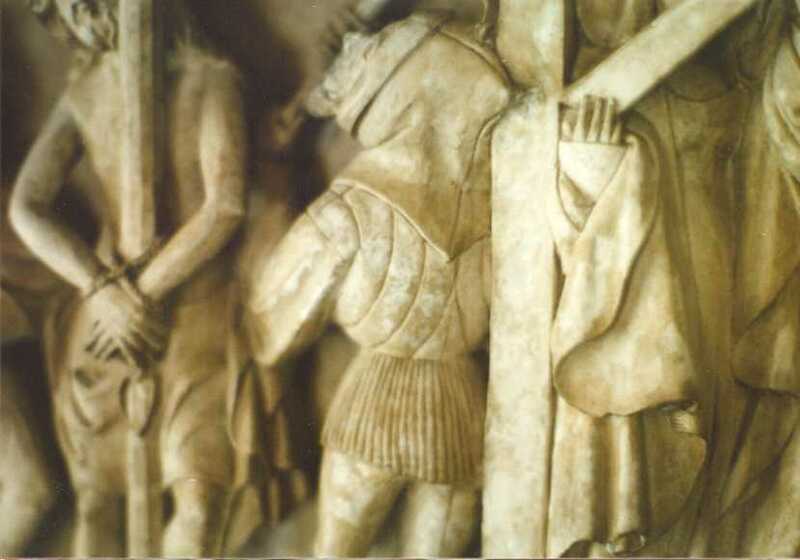 Due to the complexity of the piecing, these garments, if snug-fitting, were probably pieced and tailored on the body. Special thanks to Greta Nappa and Daria Montferrante for the Moyen Age articles. And for additional translation help from Jean-Loup Rebours and Anne Romine, I am also thankful. Bayerische Staatsbibliothek, Munich (online). Heinrich Wittenwiler: Der Ring Schwaben (? ), um 1410, Pergament, 57 Blätter Signatur: Cgm 9300, Bl.1v. Bernage, Georges. Le pourpoint de Charles de Blois. Moyen Age magazine, no. 4, pp. 44–47. Bernage, Georges. Le pourpoint a grandes assiettes (1360-1445). Moyen Age magazine, no. 33, pp. 36–40. Bise, Gabriel. Illuminated Manuscripts: Medieval Hunting Scenes (“The Hunting Book by Gaston Phoebus”). trans. J. Peter Tallon. Geneva: Productions Liber SA, 1978. Bodleian Library (online). 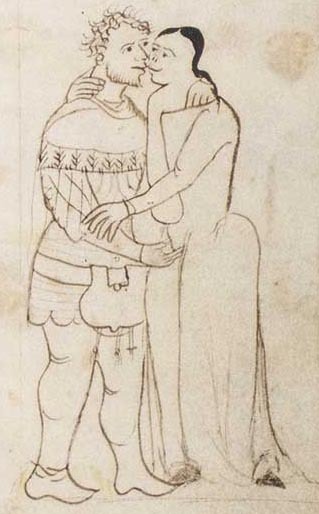 The Romance of Alexander, MS Bodleian 264. http://image.ox.ac.uk/images/bodleian/ms.bodl.264/. Gallica, Bibliothéque nationale (online). Boccaccio’s Des Cleres et Nobles Femmes, MS Français 598, fol. 40 verso. 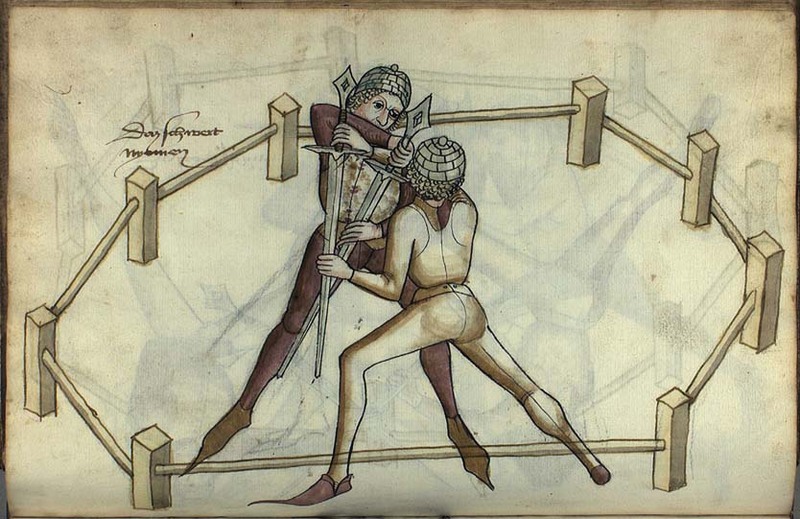 http://gallica.bnf.fr/. Geijer, Agnes, Anne Marie Franzen, Margareta Nockert. The Golden Gown of Queen Margareta in Uppsala Cathedral. Stockholm: Kungl. Vitterhets Historie Och Antikvitets Akademien, 1985. Harmand, Adrien. Jeanne d’Arc: Ses costumes, son armure: Essai de reconstitution. Paris: Librairie Ernest Leroux, 1929. Louvre (online). Paris 1400, Les arts sous Charles VI (exhibition, March 26–July 12, 2004), Goldenes Rössl sculpture-in-the-round, gilded with gold (Altötting, die heilige Kapelle, photo Bayerisches Nationalmuseum). http://www.louvre.fr/. Musée des Tissus et des Arts décoratif de Lyon (online). A jack [Charles de Blois ‘pourpoint’]. http://www.musee-des-tissus.com/. Newton, Mary Stella. Fashion in the Age of the Black Prince. London: Boydell & Brewer, 2002. Nörlund, Poul. Buried Norsemen at Herjolfsnes: an archaeological and historical study. Meddelelser om Gronland: Udgivne af Kommissionen for ledelsen af de geologiske og geogrfiske undersogelser i Gronland. Bind LXVII. Kobenhavn: C.A. Reitzel, 1924. Piponnier, Françoise and Mane, Perrine. Dress in the Middle Ages. New Haven: Yale University Press, 1997. Pognon, Edmond. Illuminated Manuscripts: Boccaccio’s Decameron. trans. J. Peter Tallon. Geneva: Productions Liber SA, 1978. Some Clothing of the Middle Ages by Marc Carlson (online). Tunic: The Moy Bog Garment. http://www.personal.utulsa.edu/~marc-carlson/cloth/moy.html. Some Clothing of the Middle Ages by Marc Carlson (online). Tunic: Herjolfsnes no. 58. http://www.personal.utulsa.edu/~marc-carlson/cloth/herjol58.html. Thomas, Marcel. The Golden Age: Manuscript Painting at the time of Jean, Duke of Berry. New York: George Braziller, 1979. 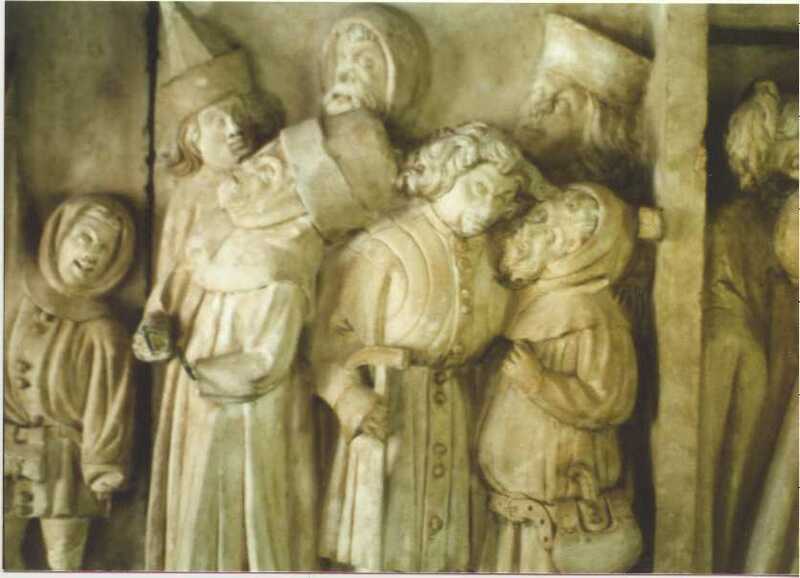 Verlet, Pierre, Michel Florisoone, Adolf Hoffmeister, and François Tabard. The Book of Tapestry: History and Technique. New York: Vendome Press, 1978. Thanks again, another wonderful page! Interesting comments re: multiple linings. I examined a early 17th c. doublet that had two layers of taffeta, then a layer of coarse fustian, and then another two layers of light lining fabric. I wonder if this was similar to how the pourpoints were constructed. Can’t wait to try! Funny you should mention this today… I am making some small use-caused repairs on a late 16thc leather doublet and velvet/taffeta trunk hose outfit made by an English historical tailor for a museum curator here in the States. The tailor was kind enough to provide a semi-constructed patch of the layers sewn together so that her customer (and by extension anyone he shows it to, including me) can see how the doublet was constructed. Multiple interlinings, including hog hair. I’m not educated on the details of 16thc doublet construction, but as I understand it, this tailor is quite expert, and her methods are highly documentable. Fascinating stuff.